BEIRUT — Turkey’s president vowed Monday to keep up the pressure against a U.S.-backed Syrian Kurdish militia after his troops captured the Syrian town of Afrin, threatening to expand the military offensive into other Kurdish-held areas across northern Syria and even into neighboring Iraq. 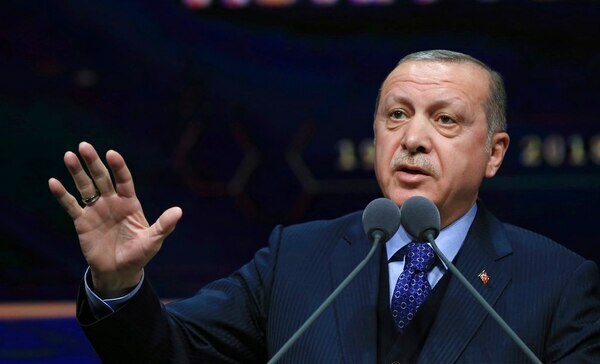 President Recep Tayyip Erdogan appeared set on forcing Washington to reconsider its partnership with the Syrian Kurdish fighters, the main U.S. ally in the fight against the Islamic State group. Turkey first launched its military operation in Syria in 2016, and Erdogan has repeatedly said it will not allow a “terror corridor” along its border — a reference to territories controlled by the Kurdish forces, which Turkey views as terrorists because of their links to Kurdish insurgents fighting inside Turkey. Emboldened by Sunday’s capture of Afrin, Erdogan went even further on Monday, asserting that Turkish troops and allied Syrian forces would press eastward, targeting territory that includes Kobani, a town that has become a symbol of the fight against the Islamic State militants, as well as Qamishli, where the Syrian government controls an airport and a security zone. 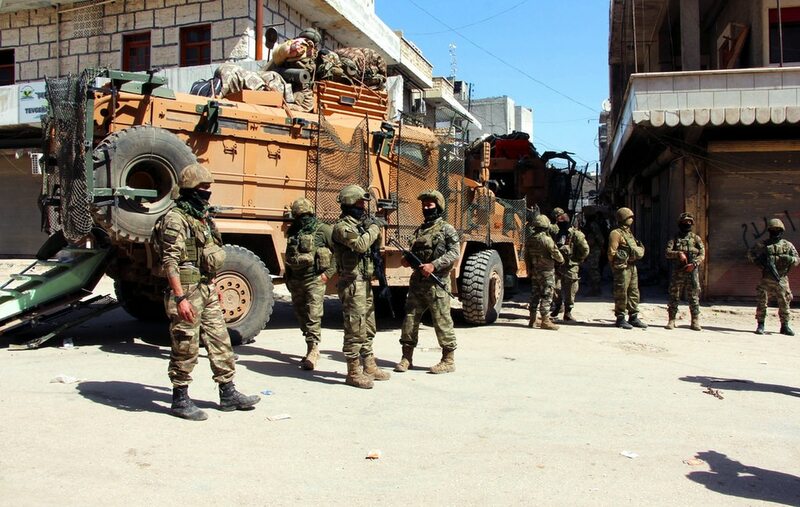 Also in the cross hairs is Manbij, a town jointly patrolled by U.S- and Kurdish forces and where U.S. bases are housed, triggering concerns over potential friction with U.S. troops. Erdogan even threatened to target Iraq’s Sinjar mountains, used by Kurdish fighters to move between Iraq and Syria, and which Turkey claims is a stronghold for the outlawed Kurdish rebels fighting an insurgency in its southeast. Nicholas Heras, a Middle East Security fellow at the Washington-based Center for a New American Security, said the capture of Afrin was a “milestone” for Turkey in Syria but was not the end of its campaign against the Kurdish militia, known as the Syrian Kurdish People’s Defense Units, or YPG. “The final destination is a Turkish war on the Kurds throughout northern and eastern Syria that destroys the YPG and forces the Americans to work by, with and through Turkey” in the fight against ISIS and in Syria, he said. U.S. support of Syria’s Kurdish militia, which Turkey views as a threat to its national security, has soured relations between the two NATO allies. Ankara has accused the U.S. of not fulfilling a promise to move Syrian Kurdish fighters out of Manbij. Seeking to ease tensions, U.S. and Turkish officials held talks about Manbij earlier this month following a visit by outgoing U.S. State Secretary Rex Tillerson. But with Tillerson’s firing, the next round of talks has been postponed. Ozgur ‘Ünlühisarcikli’, the Ankara director of the German Marshall Fund of the United States think tank, said the capture of Afrin had fulfilled Turkey’s aim of preventing the Kurdish militia from linking up its territories in eastern and western Syria, and Erdogan’s threat to expand the military operation was a bargaining chip aimed at Washington. “Politically, though, it would be very difficult to accomplish,” he said. Formidable guerrilla fighters, the YPG withdrew from Afrin on Sunday after a Turkish thrust into the town center. They have vowed to continue the fight, using hit-and-run attacks against Turkish troops in Afrin. Such an insurgency could prove to be “a big thorn” for the U.S. military operation in Syria, Heras said. “A YPG insurgency in Afrin would prompt Turkey to escalate against the Kurds throughout northern Syria, jeopardizing the U.S.-led mission to stabilize the areas captured” from ISIS militants, he said. Already, thousands of Kurdish fighters have been redeployed away from front lines with ISIS to take part in the Afrin battle, threatening to distract from the fight against the extremists. Turkey’s state-run news agency said 11 people — seven civilians and four Turkish-backed Syrian fighters — were killed on Monday in an explosion as a building in the town center was being cleared of booby traps. Anadolu News agency said the bomb was reportedly left by the Syrian Kurdish fighters. The Turkish takeover of Afrin has triggered a humanitarian crisis as thousands of residents fled the town to government-held areas. Once a safe area for tens of thousands of displaced Syrians from other parts of the conflict, Afrin residents have become Syria’s new homeless. Erdogan insisted Turkey had no intention of “occupying” Syria, saying it was merely clearing the border area of terrorists. But panic has already set in among Afrin’s residents, most of them Kurds, who fear Turkey will bring in loyalists and some of the 3 million Syrian refugees living inside its borders to repopulate the town. Some 200,000 people fled Afrin in recent days as the Turkish offensive escalated, and whether they will be permitted to return remains an open question. Many feared revenge attacks, amid reports of looting and abuse of residents in the town. Images emerged of torched stores and men, some in uniform and others in civilian clothes, walking out of homes with household goods. Others were seen driving away with tractors and agriculture supplies. A commander with the Turkey-backed Syrian forces blamed the looting on “thieves,” and said a unit had been created to prevent further theft. Azad Mohamed, an Afrin resident who fled, said looting was underway in nearby villages even before the Turkish forces entered the town. “If they have not yet stolen my things, they will in an hour,” he said. He said fear of people taking over their homes has also fueled violent sentiments among Kurds. “Some are saying those who come settle in our homes must be killed to prevent others from even thinking about it,” he said. Fraser reported from Ankara, Turkey. Associated Press writer Lorne Cook in Brussels contributed to this report.